Fungi Perfecti has sought out the best gourmet mushroom products in the world, and we are proud to offer an ever-expanding product line of new gourmet fungal treasures. Our dedicated staff search tirelessly for new gourmet mushroom delights, sampling all we can find. Then we make the best of the best available to you, our customers. Sure, it’s hard, thankless work, tasting all those gourmet goodies; but trust us, we’re up to it! 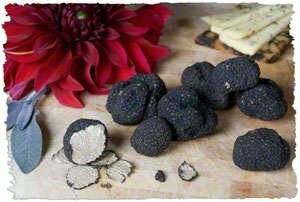 If you have a favorite truffle or other gourmet mushroom product that you don’t see here, be sure to let us know and we’ll hunt it down. Many myths have been spread about mushrooms. One of the most inaccurate is that mushrooms have no nutritional value. To properly consider them for their nutritional benefits, they must be viewed from a dried weight perspective. And mushrooms give you maximum nutritional benefit only upon cooking. Mushrooms are relatively high in protein, averaging about 20% of their dried mass. Further they contribute a wide range of essential amino acids. Low in fat (between .3 and 2%) and high in fiber, mushrooms also provide several groups of vitamins, particularly thiamine, riboflavin, niacin, biotin, ascorbic acid and Vitamin D. For more information on the nutritional properties of mushrooms, Paul Stamets, founder of Fungi Perfecti, published an extensive study of 24 major nutrients in 16 mushroom species and varieties. See: Stamets, P., 2005. "Notes on Nutritional Properties of Culinary-Medicinal Mushrooms", International Journal of Medicinal Mushrooms, vol. 7: 103–110.